With temperatures above normal, the crowd was about double the size of last year. It is hard to estimate how many Lutherans were there, but possibly close to 100. 32 people chose to ride the NID bus from Lisle, but many took public transportation. While the delegation from St. Louis, including President Harrison were snowed in and could not come, Lutherans came from Wisconsin and Michigan. This year, Good Shepherd Lutheran Church in Rock Falls participated in another way which the Life Task Force hopes to promote next year. Pastor Daniel Behmlander knew that it was too far for most of his members to come so he created a vigil service at his church at the same time as the walk. This vigil allowed members to promote the life affirming activity in Chicago through prayer, song, scripture, and walking. Please contact Kris Blackwell, kbwrk123@gmail.com if you want more information to prepare for March for Life Chicago 2020. Life & Liberty, a special presentation by Rev. 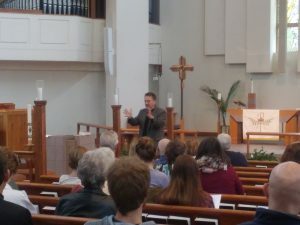 Dr. Gregory Seltz, Executive Director at the LCMS Lutheran Center for Religious Liberty, was held on November 1, at Bethany Lutheran Church, Naperville, Illinois. Dr. Seltz addressed the Christian’s place in the Public Square, the importance of the rights to life and religious liberty, current threats and challenges that Christians face in government and society, and what you can do to maintain freedom, serve your neighbor, and make your voice heard. The day began with the Order of Matins. The readings and hymns reflected All Saints Day. Rev. Craig Meissner delivered the sermon. The guest speaker, Rev. Greggory Stelz, presented 3 sessions on the topic of being a 2 Kingdom person in the real world. Very biblically based, he emphasized the shift in government from people being subjects to citizens. He followed that by helping the participants to understand the role of the church and role of the government. Any curtailment of the freedom of the church and Christians will ultimately reduce the freedom of the population as a whole. He finished the lecture by giving some very practical ways to engage in the political arena and what the Lutheran Center for Religious Liberty is doing. To find out more you can visit the website www.lcrlfreedom.org/ or text LCRL to 444999. Also you can like them on Facebook at www.facebook.com/LCRLFreedom. 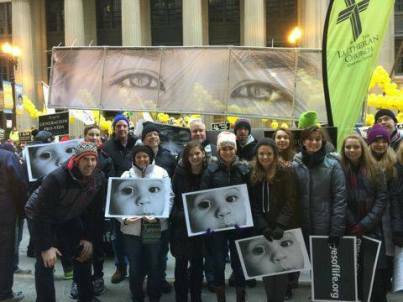 The Life Group from Bethany Lutheran Church, Naperville, Illinois, was just part of the district’s representation at the 2017 Chicago March for Life. Life ministry has become an established ongoing mission of the LCMS Northern Illinois District. Educating people about life issues and providing opportunities to put faith into action is the dual focus. 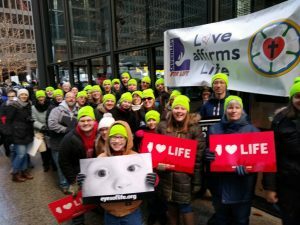 Established in 2015 by District President Dan Gilbert, the group was given the broad assignment of creating a pro-life climate within the NID over a two-year period. The group, overseen by Circuit Life Coordinator Rev. Dave Bottorff, also presented workshops on suicide prevention at St. Paul Lutheran Church in Mt. Prospect and Immanuel Lutheran Church in Belvidere and a seminar on end of life issues at St. Peter Lutheran Church in Arlington Heights and Immanuel Lutheran Church in Mokena. The Life Task Force utilized district communication vehicles (Our Northern Illinois District Magazine, Parish Resource Connection and the LCMS Northern Illinois District’s Facebook page) and appointed pastoral circuit life counselors to get the word out about each event. Affirming God’s Will to create and sustain mortal life in the anticipation of Life in Christ, The Northern Illinois District Life Task Force’s mission is to connect with church workers and their congregations by presenting unique educational and outreach opportunities about the reverence of life from conception though natural death. For more information about opportunities for affirming life in your congregation, contact your circuit life counselor or Coordinator Dave Bottorff.